In Allegheny County, Pennsylvania, much like the rest of America, one’s neighborhood has a significant impact on their risk of developing cardiovascular disease—the leading cause of death in the county. While many areas of the county are undergoing revitalization, some neighborhoods never recovered after the collapse of the steel industry, resulting in major health inequities across geographies, economic status, and race and gender identities. For Dr. Karen Hacker, Director of the Allegheny County Health Department, the first step to addressing cardiovascular disease is understanding the root causes of the problem. Through DASH, the Allegheny County Health Department is forming the Allegheny Data Sharing Alliance for Health—a connected data warehouse that combines data from multiple sources to create a more complete picture of the factors impacting the cardiovascular health of the county’s 1.2 million residents. The collaboration will merge existing disparate data sets from five sectors—public health, human services, economic development, healthcare, and transportation. 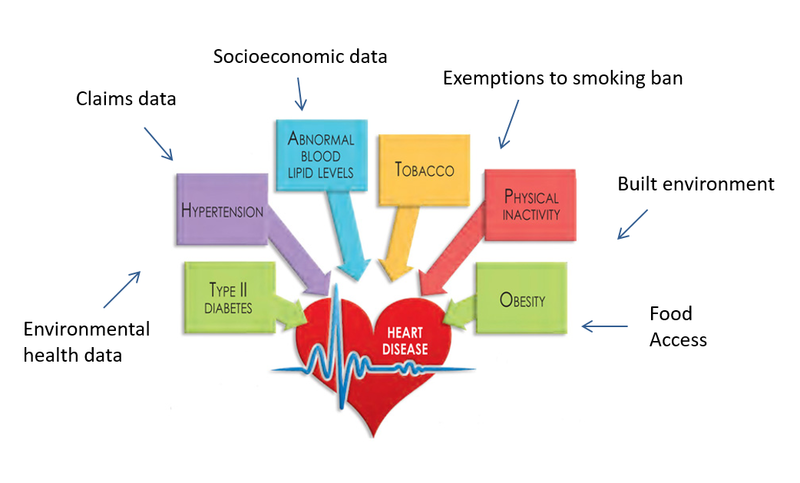 Once amassed, the data will be exported to a modeling platform, the Framework for Reconstructing Epidemic Dynamics (FRED), to develop a geographically accurate model of the complex distribution of cardiovascular disease risk factors in the county, enabling the community to effectively simulate the potential impact of various interventions. The county is currently implementing a campaign called “Live Well Allegheny” which focuses on preventing chronic disease risk behaviors, making the DASH project a timely and important endeavor that can help inform which interventions are likely to have the greatest impact on health outcomes. To advance this effort, the health department brings a strong foundation of successful multi-sector collaboration. In the year before they responded to the call for proposals, they formed an Advisory Coalition comprised of over 75 partner organizations from multiple sectors to craft a county-wide improvement plan known as the Plan for a Healthier Allegheny. Convening partners around the table in discussions about which datasets are the best indicators for understanding a health condition is critical because these other sectors play a vital role in developing and implementing interventions to address the issue. With a wide range of data sources and sectors collaborating, the Allegheny County Data Sharing Alliance for Health provides a foundation for thoughtful joint decision-making, and ultimately, more effective interventions to improve cardiovascular health. Although the alliance represents a fraction of the Advisory Coalition, the larger group of stakeholders is primed to act as recommendations for community interventions are identified. There is a growing focus on using big data to address community issues, helping the Allegheny County Health Department continue to bring new partners to the table who are interested in the data they are collecting and housing. The data warehouse will not only help community leaders be more strategic in their public health decision-making, but will also lay the groundwork to bind sectors in Allegheny County together over the long-term.